Steve Mitchell, international operative, had two jobs: get in and out of danger. 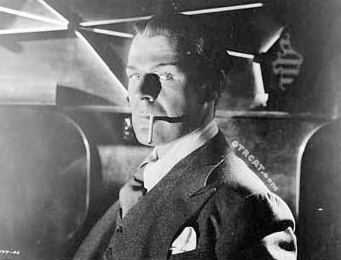 "The Nazi & The Physicist"
Film actor Brian Donlevy played Steve Mitchell, international operative whose had two jobs. Get in and out of danger. Donlevy had the voice and delivery to make the show sound plausible, even if it was routine Cold War brush fire stuff. Herb Butterfield was the Commissioner, a taskmaster shrouded in secrecy who served up the situations that Mitchell seems never to refuse. The Commissioner's secretary is played by Betty Moran. She actually seems to care about the Steve's welfare. The Commissioner is just concerned about the fare. The worldwide locations are dealt up with a feeling of local, and the characters that inhabit these far-away places with strange sounding names are solid and capably acted by veterans. Music is an almost harsh orchestra. Donlevy carries the plots with a world-weary and wary tone that makes sense, based on his occupation. 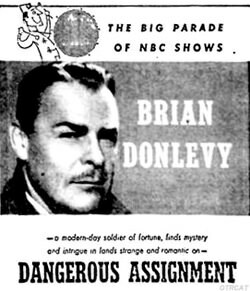 Though not top-drawer adventure like Escape, nor character more fully developed like The Third Man, Harry Lime (and not having the benefit of decades to develop or great talent like these two did), Dangerous Assignment carries enough radio punch to keep the fan of tough-guys getting in and out of jams happy. It took Ian Fleming to put this genre back on the international map "big time" with his 1952 debut Bond novel, Casino Royale. First Bond novel, perhaps the best, with the most atmosphere, the most violence and Bond at his coldest and most ruthless - ridiculous Bond flick, even with Orson Welles. 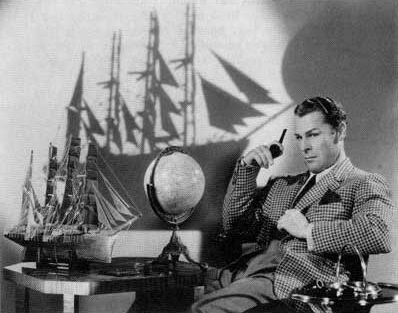 Fleming had passed on prior to the film's release, so he was one Bond fan who wasn't upset. For more espionage and adventure see: The Silent Men, Spy Catcher, I was a Communist for the FBI, Cloak and Dagger, Counterspy - David Harding!, The Adventures of Frank Race, Top Secret, Harry Lime (The Third Man), Secret Agent K7 Returns, and The Man Called X.